High Court hearing –first day – points advantage for CATI. FIRST DAY NEWS FROM HIGH COURT Tuesday 17 Dec.
Pauline’s lawyer, Alex Goodman, laid out his case for much of today, explaining why Cardiff Council’s repeated delay to enforce against Viridor’s unlawful building work and failing to require retrospective permission was unique in British law. Then Cardiff Council’s lawyer took 80 minutes, making brash assertions, some obviously in error, and was unable to grapple with the detailed legal points of our side. The Cardiff Council ethos - assert authority with confidence - to steamroller criticisms. Tomorrow comes Viridor’s lawyer, rumoured to be costing over £200 000. The Court starts at 10am and is expected to complete the case in the morning – if you can, do call in and support Pauline’s team! 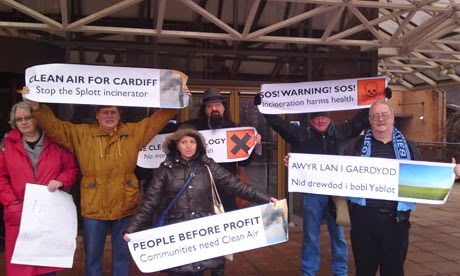 Cardiff council must “quash” decisions that allowed work to construct an incinerator to begin because they were taken unlawfully, Cardiff High Court heard today. 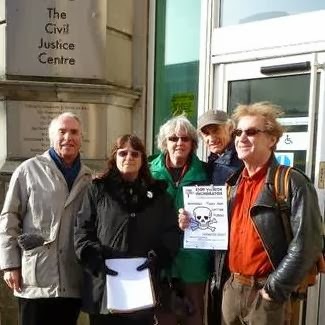 In an action brought by Cardiff Against The Incinerator campaigner Pauline Ellaway, barrister Alex Goodman told Judge Wyn Williams the authority had flouted regulations and allowed waste management firm Viridor to build in Splott when it should not have done so. “No robust action was being taken in respect of development that was continuning apace,” Mr Goodman said. Construction of the £185m plant started in July 2012 before planning conditions had been met. Developers must “obtain consent and then commence works,” Mr Goodman insisted. “It is a simple sequence,” he said. CATI’s solicitors repeatedly sent letters requesting enforcement be taken. “Throughout the claimant has taken considerable action to encourage the council to take action,” Mr Goodman said. Despite this Mr Goodman said the authority allowed work to go ahead. He claimed Viridor was allowed to report whether anything of archaeological import was discovered during building work – rather than this being the responsibility of an independent body. And this was done after building work started. “It is appropriate for the court to quash these decisions, Mr Goodman said. But Simon Bird QC, for Cardiff Council, insisted the authority had done nothing wrong. “All substantive information was supplied to the council prior to commencement,” he said. He dismissed arguments public notices had not been formulated properly. “There is no suggestion CATI were labouring under any misapprehension over what adverts meant or had any difficulty in responding,” he said. And everyone - please inform your friends of our Days-in-Court, spearheaded by Splott's Pauline "Mrs Incinerator" with leading law firm Richard Buxton's. Invite them to come and join us at the start on Tuesday 17th (9.30 for photo-shoot/TV) or drop in later for an hour or so during Tuesday and Wednesday! Russell Goodway signed a £500million contract with Viridor just a week before the challenge in the High Court, with full judicial hearing opening on Tuesday 17th? I guess Goodway rushed it because it’s likely the Court will judge Cardiff’s planning permission to be unlawful. Acting quickly to avoid Court Orders is all too common in businesses operating on the margin. But can Goodway escape so easily when subject to ‘malfeasance in public office’ and ‘due diligence’ tests? This costly contract gives extra spice to the Court hearing - give Pauline support and hear her legal team tearing into the Council and Viridor for building without permits! The law must make big Councils treat mega-companies just like they do small firms who build without approved plans! On the day Prosiect Gwyrdd led by Russell Goodway gets the Go ahead for Prosiect Gwyrdd..
Chairman of the Joint Committee is wrong to say they will make significant savings from this project." from this huge long-term burden." who want to impose waste policies on SE Wales that are at least 20 years out of date? environmentally viable processes have been disregarded." Silence on toxic ash - where will it go? Produces significant quantities of CO2. discourage waste reduction, reuse and recycling efforts. checked prior to signing the huge contract with Viridor. 2. No updated Value-for-Money assessment has been made, neither by the Project or by the WG review. before they sign the Hinkley Point nuclear deal. who are already considering the PG contract. Start Tuesday 17 December, for two days in theCardiff High Court. 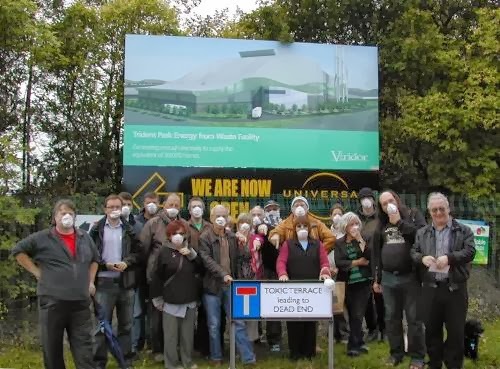 The full legal hearing to quash Cardiff's approval of the Viridor waste incinerator  is now scheduled to start Tuesday 17 December, for two days in the Cardiff High Court. The leading environmental and public law firm, Richard Buxton, is representing CATI member, Pauline Ellaway. The full hearing should consider whether “the process adopted by the Defendant Council amounted to an impermissible extension or addition to any previously-recognised exception to the Whitley principle”. (Viridor) in the first place in proceeding to begin works prematurely, as they did, and of the Defendant Council (Cardiff) in protesting only after being prompted to do so by CATI, and then effectively condoning such conduct in the ways in which it subsequently dealt with matters”, raises questions of the Council’s “procedural propriety”. CATI opposed the incinerator in principle, Dave Prosser a CATI campaigner said “We feel betrayed by Cardiff Council’s completely inadequate consultation of the public over this matter of high public concern and in pushing through approval of the incinerator in the Splott/Cardiff Bay area despite the large population potentially harmed by the pollution” . The Ombudsman decided in 2012 on a complaint from CATI that the Council was guilty of maladministration, causing an injustice to residents . The Council had to apologise to individuals but failed to reconsider and change their poor practice. 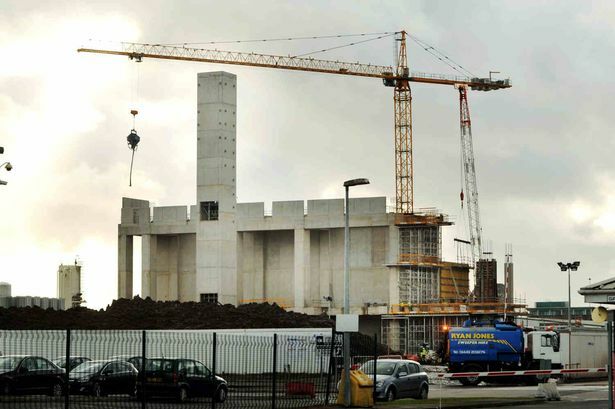 Waste incinerator under construction at Trident Park, between Splott and Cardiff Bay, at a cost of £185 million. Construction started in July 2012, just as further ‘subsequent’ planning applications were published for consultation. These were not approved till Feb. 2013; the Court case challenges them as legally flawed. Entirely unsuitable for the Splott and Cardiff Bay site on grounds of lorry traffic, flood risk, hazard to health and processing hazardous ash. Only UKIP and TUSC candidates - Brian Morris and Katrine Williams @Katrinewilliams - are concerned to oppose the Viridor waste Incinerator, bringing wastes from over S-E Wales to burn in our city. 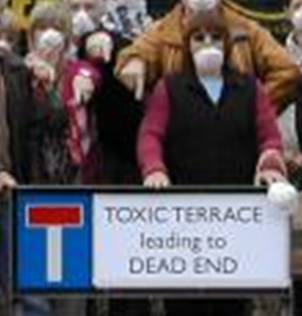 The Lib-Dems started the project and Labour continued it with Tory support; all want to give Viridor a long-term contract to burn the city's waste, despite the toxic fumes, waste lorries trucking through the city and huge tonnages of incinerator ash with toxic dust. Apart from Neil McEvoy for Plaid, Cardiff politicians rubber-stamped a Viridor contract of several £100 millions for 25-years. Extraordinary irresponsibility with Council funds, and in contracting for tonnages far higher than expected to be produced in future years. Result of brown envelopes or blind party-voting? CATI hasnt heard anything from @EdwardStubbs the labour candidate who works for a Islwyn Labour AM Gwyn Price. As soon as Labour got into office they voted to privatise residual waste Prosiect Gwyrdd - without any scrutiny, locking Cardiff into payments for burning waste for the next 25 years in a PFI style contract. Labours Gretta Marshall, Luke Holland and Huw Thomas all failed to vote against it. Surprise! Russell Goodway is chair of the 5 council Prosiect Gwyrdd group. Nearby Bayside Estate resident Pauline Ellaway, supported by CATI, is taking Cardiff Council to the Cardiff High Court on 17-18 December. Full legal hearing to quash Cardiff's approval of the Viridor incinerator as unlawful - and stop the construction - opens on Tuesday 17 December in the Cardiff High Court. Leading environmental lawyers, Richard Buxton, are representing CATI member, Pauline Ellaway. In the first stage High Court verdict on 1st October, Judge Curran was appalled at the Council's catalogue of errors. Do come along and encourage the full hearing for orders on the Council. Do drop in on the Court hearings for an hours or two, during 10am-4pm on the two days 17-18 December.